I’m going to the International Food Blogger Conference (IFBC) this month and I can’t tell you how excited I am, especially since it’ll be my first blogging conference. While I’m not planning on making my blog a source of income (not anytime soon) nor do I have a big internet presence, I want to learn a few tricks and make this little space a bit better. More importantly, I want to connect with other bloggers IN REAL LIFE, especially those I’ve gotten to know online over the past year, like Alice from Hip Foodie Mom, Liz of That Skinny Chick Can Bake, Linda aka The Urban Mrs., Vane of Sweet-Lab and Chung-Ah of Damn Delicious. All of these amazing, talented ladies will be there and it’s going to be out of control in the best possible way. There are also countless of other incredible bloggers who I’ll be meeting for the first time. I’ve been disgustingly jealous of all the other blogger events that have been held this summer and now I can experience one myself. When I saw that Dorie Greenspan was going to be the keynote speaker, I immediately messaged Alice and strong armed her into going (so that I wouldn’t be alone, of course!). I can go to the washroom by myself without a buddy, thank you very much, but attending a conference with hundreds of attendees without the comfort of a friend? That’s still a bit beyond me. I adore Dorie – her book Baking From My Home To Yours is my absolute favourite. I’m going to bring it with me on the off chance that I can get an autograph (in other words, I’m going to hunt Dorie down until she signs it. Some call it stalking, I say I’m an adoring, determined fan. It’s flattering, yo!). I’m heading to IFBC already knowing about Dorie but I was recently introduced to Kathleen Flinn after browsing the IFBC website. Kathleen will be one of the featured speakers, heading a session on writing titled “The Elements of Style.” She’s a Seattle-area writer and chef, whose first book “The Sharper Your Knife, The Less You Cry” chronicled her experiences at Paris’ Le Cordon Bleu and is a New York Times best-seller. Her most recent book is called “The Kitchen Counter Cooking School: How a Few Simple Lessons Transformed Nine Cuinary Novices into Fearless Home Cooks.” I was super intrigued by the description of her book and after visiting her website, CookFearless.com, I knew that I had to read it. I ordered it from Amazon and soon, it was in my hot greedy hands. I devoured that book in a matter of days. Listen, I am in no way affiliated with Kathleen Flinn or her book. I’m not being paid to talk about it (I wish!). Nor do I expect anything from this post. I just wanted to share how much I enjoyed reading her book. She writes in a very easygoing, natural manner. It’s as if you’re listening to a fabulous, smart, thoughtful girlfriend telling not only a fascinating story but educating you as well, in a way that’s not offensive or judgmental. What I really loved was how she provided important information in an entertaining manner. For example, did you know that the US throws away 40% of the food produced for consumption per year, with a large percentage of it being thrown away in people’s homes where it ends up in landfills emitting clouds of methane, a greenhouse gas more toxic and damaging than carbon monoxide?! It’s appalling! That’s why Kathleen and the chefs featured in her book recommend not buying in bulk and only buying enough for a few meals. When your produce looks less than fresh, throw it all together into a dish that utilizes it, like soup or salad. Waste not, want not, save money and take care of the environment. I was totally captivated by how Kathleen worked up the nerve to walk up to a stranger in the supermarket to help her make wiser food choices. It led her to create a class to teach nine women of all ages, races and economic statuses how to really cook. It’s an inspiring read and shows that with a little bit of knowledge and a whole lot of enthusiasm, you can change the way one eats and lives. Food is such an intimate part of our lives. People judge each other on the choices we make in this arena and when a way of eating and cooking is so deeply engrained, it’s super difficult to make a lasting genuine change. 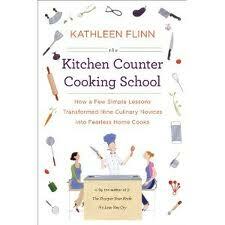 I highly recommend this book and I can’t wait to meet Kathleen at IFBC. Hopefully I run into her (which should be easy to do since I’ll be, y’know, following her) and she can sign my book. I’m sharing with you my last summery recipe (I know, there’s absolutely no connection between my recipe and my post today. C’est la vie!). Ever since discovering the magical two-ingredient, no-machine method of making ice cream, I’ve made it four times with different flavour combinations. I present to you: caramel swirl chocolate ice cream (with rum. Because I’m a freaking lush). 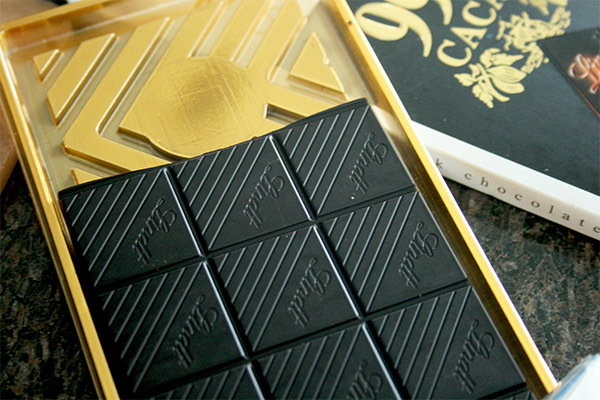 99% dark chocolate. I didn’t even know they made it this dark! Combine whipping cream, condensed milk and vanilla in a large bowl or the bowl of your stand mixer. Whip together until medium peaks form. 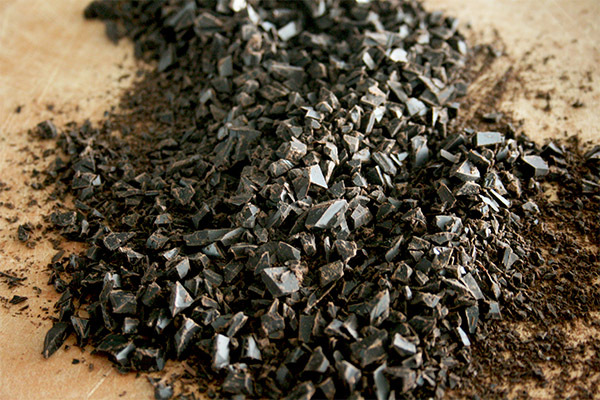 Add in the chopped chocolate and gently fold it in until evenly distributed. You can use your favourite caramel recipe or store-bought caramel like I did. If using rum, pour it into the caramel and mix together until fully combined. 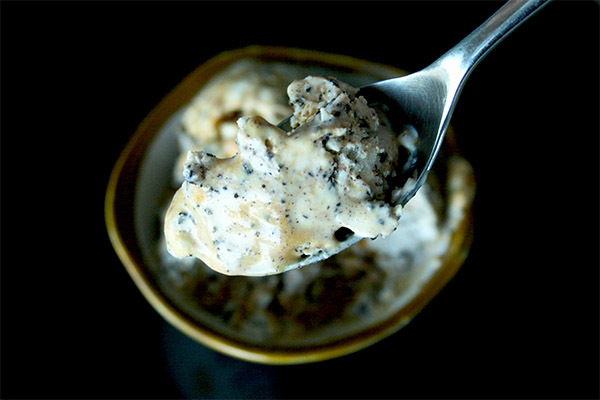 Add half of your ice cream mixture into your freezer-safe container. 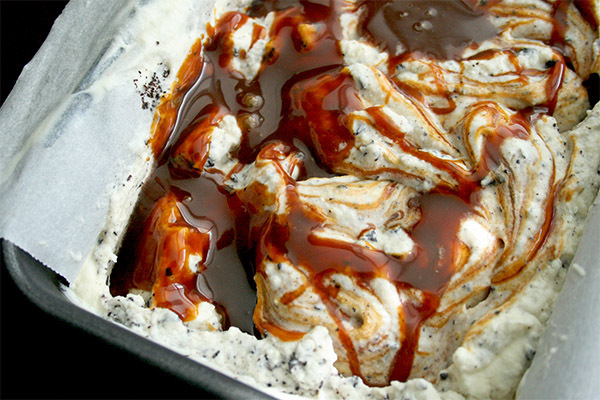 Drizzle half of the caramel over top and using a knife, swirl it through the ice cream. Pour the other half of the ice cream mixture over top and drizzle the remaining caramel over top. Again, use a knife to swirl it through the ice cream. Place in the freezer for at least 6 hours until firm. Remove from the freezer for about 10 minutes so that it softens enough to scoop. 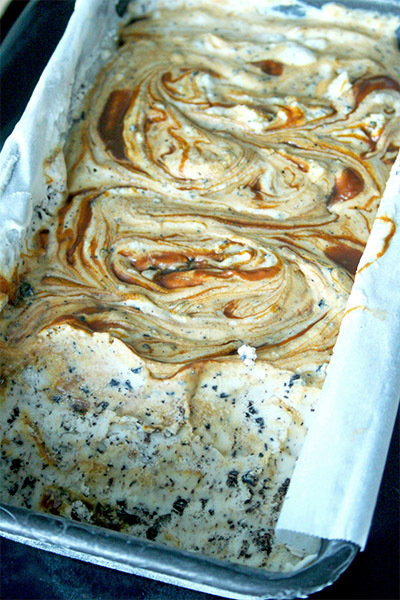 I used insanely dark chocolate (99% baby) which I felt countered the sweetness from the ice cream and caramel perfectly. And people, I cannot stress enough how good the rum tasted with the caramel. I can’t believe it’s already September and summer’s over. You won’t judge if I continue making ice cream through the fall and winter, right? I wish I could join you but my wallet declined the request. HA! Have fun and take notes. I hear ya about the wallet, DB. That’s why I couldn’t go to the Food and Wine Conference or any of the amazing events on the East coast. Plus I don’t have a lot of vacation at my work. I’m only a two hour drive from Seattle so I don’t have to pay lots for transportation. It’s totally going to be fun – too bad you couldn’t go! Wow how exciting; a food blogger conference! I would love to join you! 🙂 The ice cream looks and sounds very delicious! It’d be so much fun to meet in “real life,” right?! Whereabouts are you? A sleeve would be great! Or her wallet? Whatever. Thanks, girl! And seriously, ANY time is good for ice cream! Just like how it’s perfectly acceptable to eat it in the winter. Oh, I’m so jealous, you’re going to have so much fun at IFBC! I’ve only been to two food blog conferences, and while they can be overwhelming, they’re so helpful and I always come away having learned so much. And I love finally putting faces to names! Also, from one lush to another, this ice cream looks faaabulous!! Definitely pinned and bookmarked. Hey Ruthy, I’m already expecting to get overwhelmed at IFBC. Did you read the hilarious post Irvin Lin (Eat the Love) wrote about attending blog conferences? He mentioned how it’ll seem like all the cool bloggers will form cliques and us lesser bloggers will want to be part of the cool group. I don’t see that happening – I really can’t wait to meet everybody. I mean, we all love food and eating. It’s going to be awesome! I always love meeting another lush – hopefully one day we’ll be at the same conference and we can share a few (or many) drinks! Yum, I absolutely loving making homemade ice cream and this looks amazing! Thanks so much! 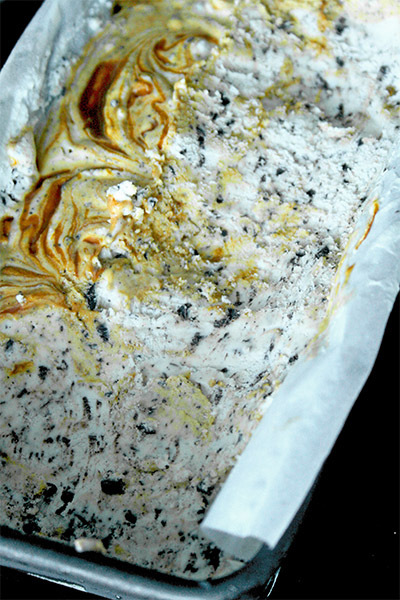 My ultimate goal is get an ice cream maker so that I can really make fancy pants ice cream. I just need a house to store it in. Someday! Lol, thanks Kayle! I’m sad you won’t be there either. One day, we should just hold one giant convention/party and all of us can meet, eat and drink! It’ll be glorious. Hooray!!! It will be SO fun to meet you, Alice and Linda (and see Chung-Ah again)!!!! It won’t be long!!! Thanks, Liz! That means a lot coming from you. It’s an understatement to say that I’m looking forward to meeting and spending time with you ladies. I’m going to do a lot of fan-girling that weekend! SOOOOOO JEALOUS doesn’t even begin to describe how I feel that you’re all meeting!!! Have a great time in my name, bring pictures and I think I deserve some of this ice cream too! You definitely deserve ice cream, Paula! And I know that someday we’ll meet and it’ll be amazing! Like seeing a long lost friend because I already feel like we’re friends. Big hugs, girl. Can’t wait to see you! It will be tons of fun! 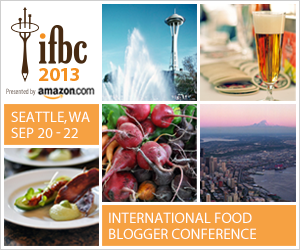 IFBC is around the corner and my excitement level is growing higher and higher and higher! I’m so looking forward to hanging out. Let me know if you need company while you try to meet (a.k.a. stalk) Kathleen Flinn 😉 Hahaha! I really need to try this new non-ice cream machine method of making ice cream! This caramel swirl chocolate ice cream looks amazing! I’m getting more and more excited with each passing day too! I’m glad you’re volunteering to stalk celebrity chefs with me. You’re a real friend! Oh my gosh, I totally feel you on going to a conference like this on your own. I would’ve called a gf too just so I wouldn’t go alone. I haven’t gone to a blogging conference yet and there was so many going on this year! Every time I heard about one, it seemed as though another was happening and I missed it (shrug). I hope next year will be a better year; after all, I just started blogging as of late Feb (I’m a noob) LOL. Well, I hope you have a fantastic time. I can’t wait to hear about it! Omg I’m soooooooooo jealous I wish I could go!!!!! Have tons of fun–that sounds like an amazing panel of speakers and an amazing bunch of ladies who are going 🙂 Also, this ice cream. STOP IT. I’ve been living on pure sugar (+ wine and cheese) this past week and I do NOT need more temptation! 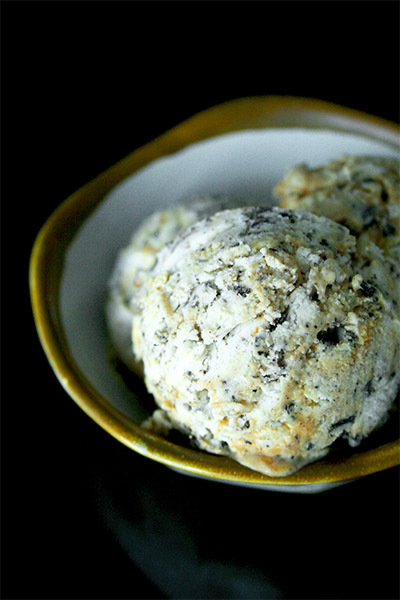 2 ingredient ice cream? 2 easy 😉 Ahhh. I really really wanted to go to this one, because a) I wanted to meet you. b) I wanted to finally see Seattle in the fall and c) I’ve heard great things about this conference. Oh well, next year right? Oh but I will be back in Seattle during Christmas, so you need to come down again, can we make this happen and can you bring the ice cream? It should be cold enough for it not to melt! Ahh I so wish I was going to meet you and hunt down Dorie together! I own I think 6 of her books, and she is coming out with another one I think next fall. I’m putting Kathleen’s book on my to read list. I remember when Food Network did a special on how much food people wasted, especially produce. Stores throw away “bad” produce which are in reality still edible. People won’t buy ugly potatoes, slightly bruised tomatoes, torn lettuce, etc. Farms are the same way if they offer pick your own options because people may pick an apple, change their mind, then throw it on the ground. It really does make you think twice about produce (and food in general, but produce was a huge culprit). Ive never been to IFBC but I know it’s THE conference to go to from a true foodie perspective. Less about ‘how to grow your blog’ and more about focusing on fabulous food. I know you’re going to have a blast! The ice cream looks incredible! 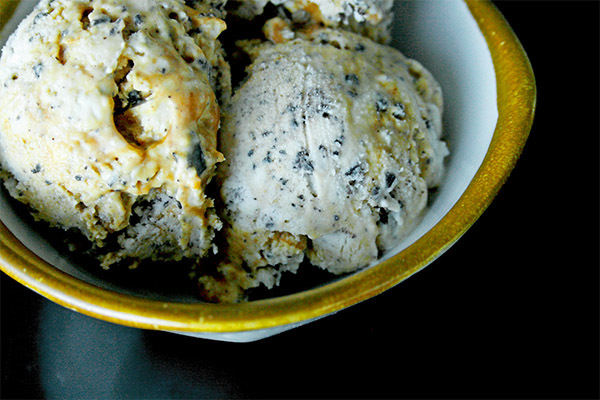 I made a salted caramel-bourbon-chopped Nutter Butter Cookies ice cream this summer. No ice cream maker and it was so easy and good and dangerous. Yours looks the same! I am so jealous and excited that you get to go to IFBC!!! Take a billion photos and eat a lot of good food – I can’t wait to see the posts for it! 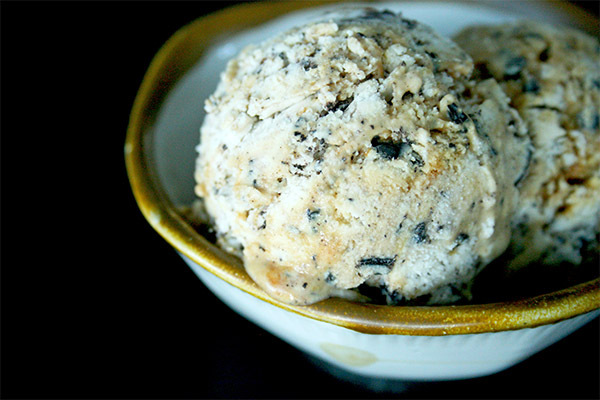 This ice cream also looks insanely delicious – Caramel + chocolate = always a win. It’s hard to believe that after so many months. . it’s finally here! I seriously am so excited and can’t wait to meet you and everyone else! dude, love this post!! I will definitely have to check out Kathleen’s book and HELLO?! Aren’t you becoming the ice maker extraordinaire?! Freaking love this!!! see you soon, girl! How exciting for IFBC!!! And this ice cream is fabulous! I can’t believe summer is over and I never got around to trying the 2 ingredient ice cream. Don’t mind me while I go lament in the corner for a bit. Annnnnd, I’m back. On another note, I’ve been dying to attend a conference as well, but alas, it’s not in the cards for me this year. I hope some day soon I’ll be able to meet some blogger friends, including you! And can I just say how happy it made me that you convinced a friend? Seriously, tackling a conference by myself sounds completely overwhelming. Glad I’m not the only one who has a buddy system policy in place for all groups over 20 people. 🙂 I hope you have an absolutely fabulous time at the conference! Oh how fun! I would LOVE to attend! And this ice cream couldn’t look or sound better. Thank you so much for sharing yet another delicious post. I’m hungry now! I hope you are having a great Tuesday! I am SO JEALOUS that you’re going to that conference – you’re going to have a great time! Sadly, I seem to never hear about these conferences until it’s too late for me to come. I need to start seeking them out and putting them on my calendar, I guess. Can’t wait to hear all about it! That’s awesome about the conference!! And this ice cream, wow. I could eat this every day of the week!! I have never been to a conference either. Hope it was all you have hoped for!!! This ice cream has me staring with my mouth open, drooling. Love it!! I’m a tad bit jealous that you’ll be meeting a bunch of my fav bloggers and get to listen to Dorie speak about food. This ice cream is wicked delicious looking. Have fun at the conference, and eat extra for me. I love your no ice cream maker needed recipes, Nancy! I don’t want another appliance cluttering up my already cluttered kitchen. This way I can have my ice cream and eat it too! 🙂 Caramel and chocolate are a favorite combo. With the St. Louis weather in the 90’s, ice cream is definitely called for! I went to my first food blogger conference this summer. The St. Louis Food Media Forum was small but so much fun. No matter the size of the conference, there is always something to learn, and best of all, blogging friends to meet! Before going,I contacted Shannon from A Periodic Table Blog (also from stl). We had never met in person but “knew” each other from our blogs and we went together. The buddy system makes a room full of new faces way less intimidating. By day 2 the faces weren’t unknowns anymore. 🙂 Have a wonderful time at the conference!! I hope you will blog all about it! Another amazing ice cream recipe Nancy! I love chocolate and all the caramel swirls throughout. I absolutely love the flavor of caramel. I bet you are going to have such an awesome time at the conference too….You are so talented and hilarious….the other bloggers will be thrilled to meet you! Had a dinner party last night with the girls. Made this ice cream for dessert. It was delicious! A nice accompaniment to the apple pie that I made too. Hello blogger, do you monetize your gottagetbaked.com ?